Since the publication of the first edition of Architectural Technology, in 2002, there have been significant developments in the number of courses, the profile of the discipline as well as significant changes in the Construction sector. 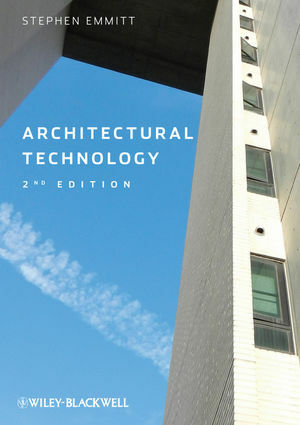 The Second edition of Architectural Technology addresses these challenges directly. Much greater emphasis is given to the three core themes of the book - Environmental Sustainability; Innovation; and Design. An increase in the visual material included reinforces the critical role of Design, aiding students to better translate conceptual designs into built artefacts. Building upon solid teaching practice from the previous edition, Architectural Technology is now more concisely structured to take the reader through the whole life cycle of a building, emphasising sustainability and building performance. Material on digital information, building information modelling (BIM) and information communication technologies has been updated. Most chapters have been re-titled to emphasise the importance of design and make the book more accessible to a wider range of students. Chapters conclude with updated/more extensive links to further reading. Thoroughly revised and updated this undergraduate level textbook is essential for Architectural Technology courses. Students studying Architectural Engineering, Architecture, Building Surveying; and more general Construction courses, will find the material invaluable. Stephen Emmitt, BA(Hons), Dip. Arch, MA(Prof. Ed. ), PhD is Professor of Architectural Technology at Loughborough University; he is registered architect with industrial experience and extensive teaching experience of Architectural Technology across a wide range of built environment courses, in the UK and internationally.